An extremely rare and valuable Beatles record that was found languishing in a loft is to be auctioned next month. 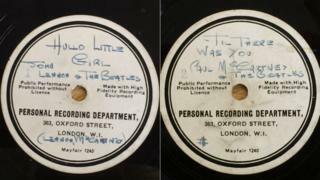 Described as "a Holy Grail item", the 1962 10-inch record of Till There Was You and Hello Little Girl lay forgotten in the home of Les Maguire for decades. Maguire, the keyboardist in fellow Liverpool act Gerry and the Pacemakers, said it could be seen as the record "that sparked The Beatles' success". The acetate bears the handwriting of the Fab Four's manager Brian Epstein. A conservative estimate is that the 78 RPM record - the first Beatles disc to be cut before the band broke through into the national charts in late 1962 - will fetch upwards of £10,000 when it is auctioned, although it is such a rare item it is difficult to predict what the sale price will be. The record of Till There was You - mislabelled by Epstein as 'Til There was You and described as being the work of "Paul McCartney & The Beatles" - was made at the HMV store in Oxford Street, London. It was presented to future Beatles producer George Martin at the EMI record label in a bid to secure the band a recording contract. Hello Little Girl, on the other side, which was again mislabelled by Epstein - as Hullo Little Girl - was described as being the work of "John Lennon & The Beatles". Maguire, 74, of Formby, Merseyside, was given the disc by Epstein in 1963 after it had been returned to him by Martin. Maguire described the record as "a special piece" and "a one-off". "I've never been a big fan of memorabilia, but people seem to like it," he said. "It's no good to me so I've given it to my granddaughter, who is hoping to buy a house after passing her accountancy exams. I hope it goes for a good price." The record is being sold for the first time, having been locked away in Maguire's loft, carefully wrapped in paper, for more than 50 years. Beatles historian Mark Lewisohn said in his book, Tune In, that the uniqueness of the disc is "enhanced by Brian Epstein's handwriting on the labels, and the recognition of what it led to". Despite initial reticence from Martin, The Beatles would sign to EMI in 1962 before going on to become one of the most successful and influential bands of all time. The recording is, Lewisohn wrote, one of the "rarest and most collectable of all Beatles records". Ian Shirley, editor of Record Collector Rare Record Price Guide, described the disc as a "Holy Grail item". He said it would "fascinate Beatles collectors worldwide" and would "no doubt attract bids from those with deep pockets".